July 06, 2005, L. & E. Crabo. 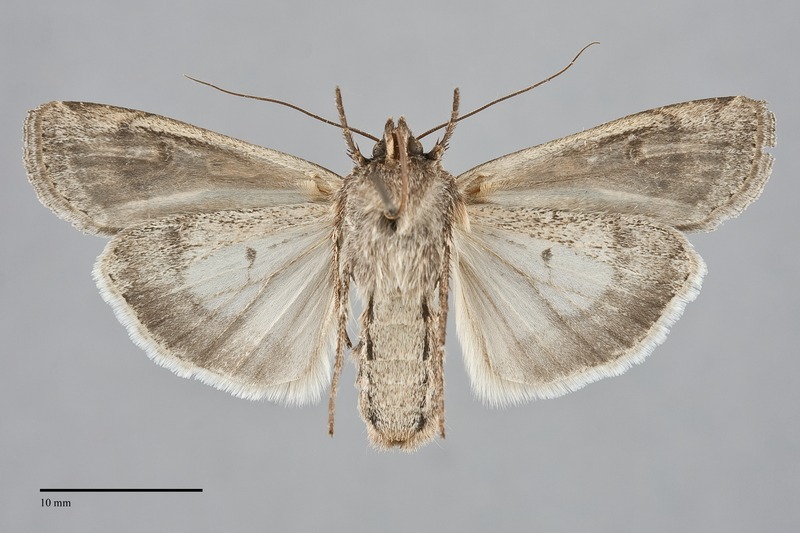 Euxoa auxiliaris is a common moderate to large Euxoa (FW length 17–22 mm) with long narrow forewings and several distinctive forms that flies on both sides of the Cascades and at high elevations from late spring until late fall. 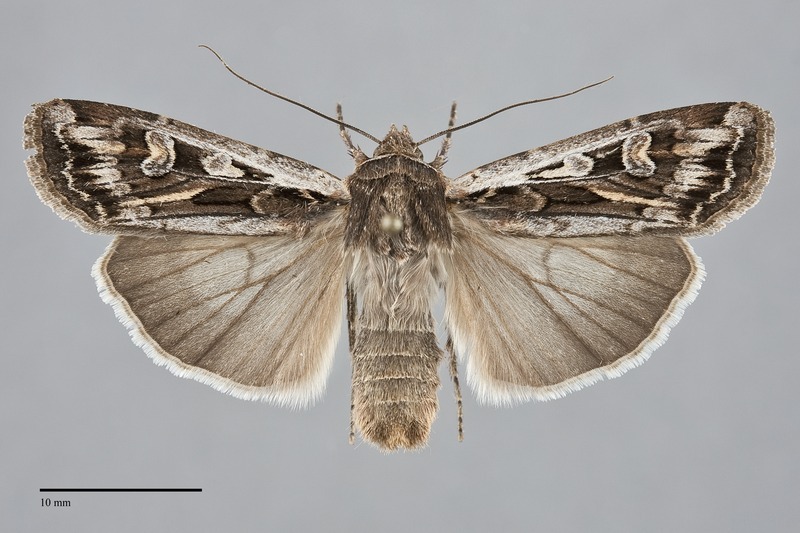 The forewings are more narrow than those of other Euxoa species and appear somewhat rectangular in shape. Two dominant forms exist, one with streakier pattern with a light costa, light-filled forewing spots, and black basal dash and filling of the cell, and a duller light to dark form without contrasting markings. Forms with a strong pattern and pale costa are dull ochre to silver-gray in the subterminal area, along most of the posterior margin, and at the apex, with dark gray-brown suffusion on the mid-portions of the base and median area, sparing an ochre streak in the fold. The costa is dull ochre to silver gray, and the cell is dark brown-gray to nearly black. A black basal or subbasal dash is present which is interrupted at the basal line. The cubital vein is whitish gray to the reniform spot. The terminal area is dark gray. More uniform forms are quite variable in color, ranging from powdery light to medium-dark gray, tan, dark gray-tan, or black-brown. The terminal area is gray, but usually lighter than in the more contrasty forms. The lines are gray, partially black, double and filled with the ground color or lighter gray or tan. The antemedial line is strongly zigzagged and angled toward the outer margin, with a dominant black laterally convex segment at the base of the claviform spot in forms with the pale costa and more even across the wing in the more uniform forms. The medial line is gray, diffuse, faint or absent. The postmedial line has a finely scalloped inner component and faint even outer component, is strongly pulled toward the base on the costa, broadly curved across the anterior two-thirds of the wing, and then straight at a 45° angle toward the base near the posterior margin. The suberminal line is light yellowish or gray, weak to moderately prominent, offset below the apex and forming a very weak W-mark on the mid-wing. It is preceded by gray spot on the costa and a gray to brown shade on the mid- and posterior wing, often condensed into a series of strong black chevrons between the veins. The terminal line is absent, a thing dark line, or a series of dark triangles. The fringe is variable, most often light to dark gray, less often tan. The orbicular and reniform spots are outlined in outer gray to black and inner whitish gray, ochre, or tan. The orbicular spot is a slanted oval to an irregular bar, sometimes entirely pale but usually with a darker gray center. The reniform spot is moderately large, kidney-shaped, filled similarly to the orbicular spot but with greater dark gray or brown-gray central filling and a gray spot at the lower end. The claviform spot is absent or long and narrow with a pointed tip. 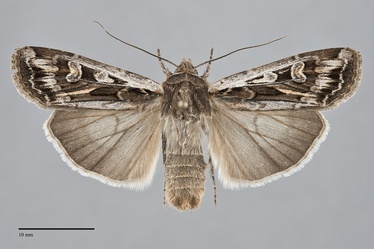 The hindwing is broad given the narrow forewing, pale gray at the base and gradually darker gray on the outer half, with dark gray veins, discal spot, and terminal line. The hindwing fringe is white with an ochre and gray base. The head and thorax are gray-tan, gray-brown, or blackish-brown, matching the forewing. Specimens with a pale costa have similar color at the base of the collar, separated from the tan edge by a black transverse line. The male antenna is biserrate. Euxoa auxiliaris is the most common of two Pacific Northwest members of the subgenus Chorizagrotis. 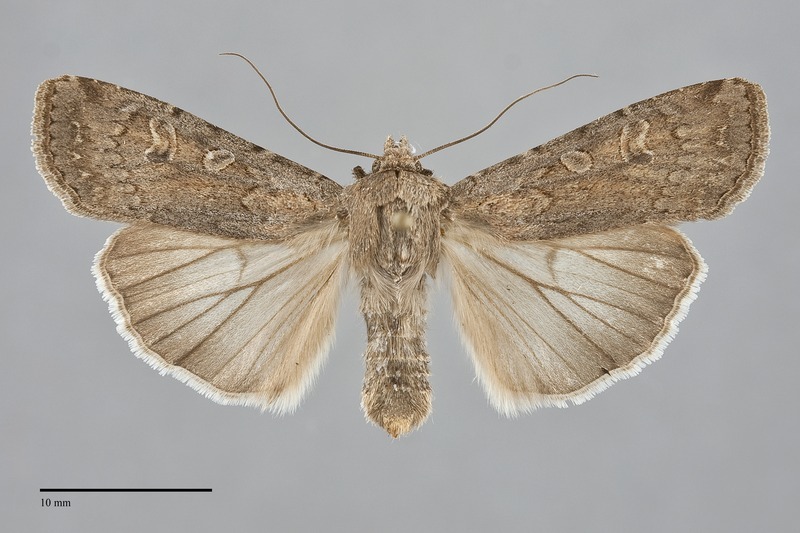 This subgenus has several unique features, including the combination of short harpes and apically spoon-shaped saccular extensions in males and dorsoventrally flattened abdomen in females. This species can usually be recognized despite its variablity due to its large size and narrow wings. 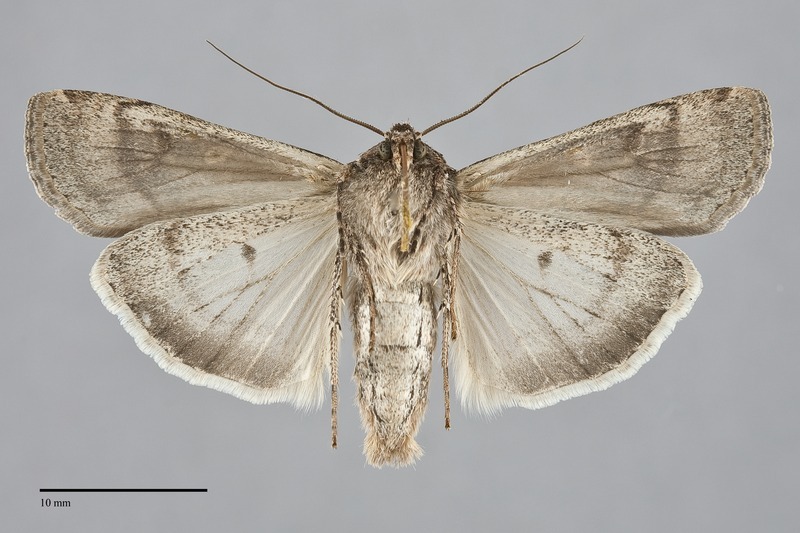 Specimens with pale costa and those with duller gray forewings resemble forms of Euxoa olivia, a species with which it flies during the fall. 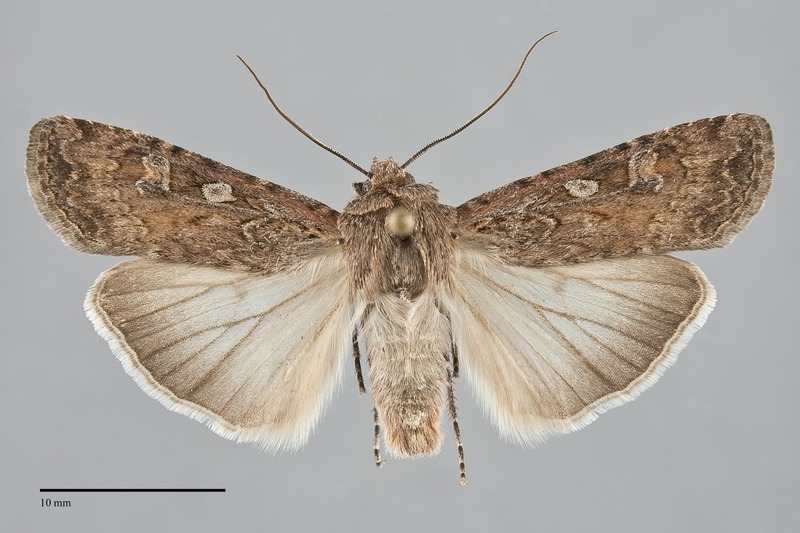 This species is smaller (FW length <18mm), and its postmedial line bends below the costa and is nearly straight across the rest of the wing rather than curving over a wider portion of the wing as in E. auxiliaris. 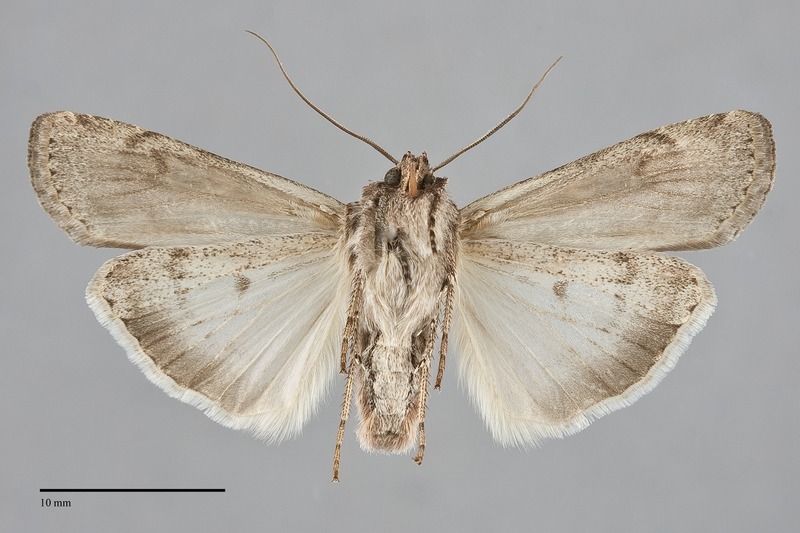 Euxoa simona is a large mottled species which flies with E. auxiliaris in the mountains and at lower elevations. 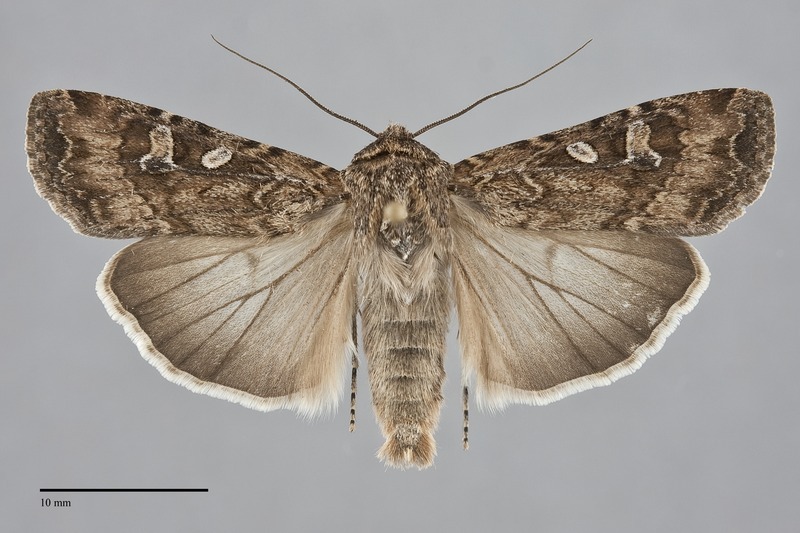 It resembles some gray forms of E. auxiliaris but has a broader forewing, more mottled and powdery gray color, a larger and rounder orbicular spot that usually lacks a paler inner line, and a gray cubital vein. This species breeds in open grassland and agricultural habitats across the western United States. The adults migrate to higher elevations during the summer and are commonly collected in a variety of habitats, including alpine tundra. It is common late in the season in disturbed agricultural, urban or riparian areas at low elevations. Euxoa auxiliaris is widely distributed in the Pacific Northwest. It is common in the dry basins of eastern Washington and Oregon and in the mountains to middle elevations. There are a few records from west of the Cascades but it is much less common in this part of the Northwest than from further east. This species is common and widespread throughout much of western North America, occurring as far east as Michigan and Texas and as far north as Northwest Territories. It is especially common on the Great Plains, where migrating adults accumulate at high elevations in the Rocky Mountains in numbers large enough to provide a significant source of food for grizzly bears. Although Northwest populations also migrate to high elevations they are not nearly as numerous as in the Rockies. 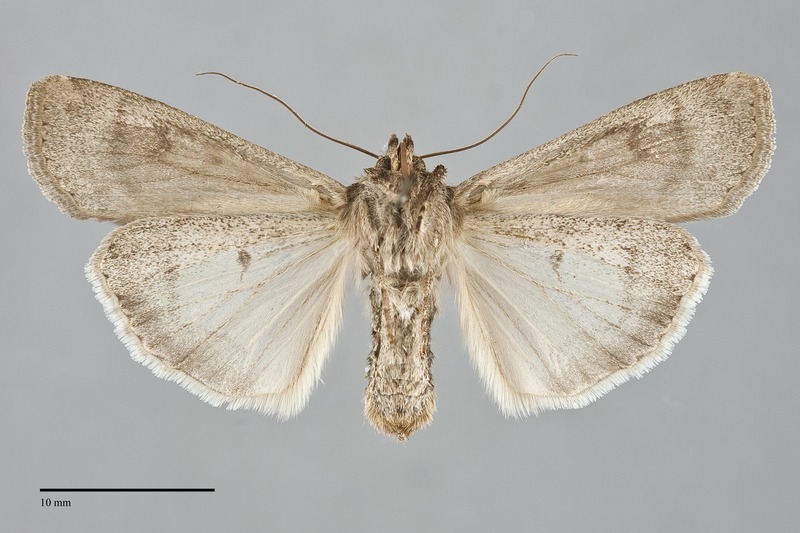 This species is a soil-surface feeding cutworm that feeds on general herbaceous vegetation, but shows a preference for feeding on grasses (Poaceae). Adults are single brooded but have a long flight season. They emerge in late spring and early summer and migrate to the mountains to aestivate until late summer and fall. In the Northwest, most records are from mid-May to August, with an second peak in the fall after the aestivation period. They are nocturnal and come to lights. This species is a major agricultural pest in the southern and eastern United States, and causes extensive damage to cereal crops. During epidemic outbreaks it feeds on many types of herbaceous crops.